For the second-straight season the Buffalo Sabres sit below the salary cap floor ahead of the opening of free agency. This is something I touched on last summer prior to free agency opening and my stance this year remains the same as it did last year; getting to the salary cap floor is the least of Tim Murray’s problems. 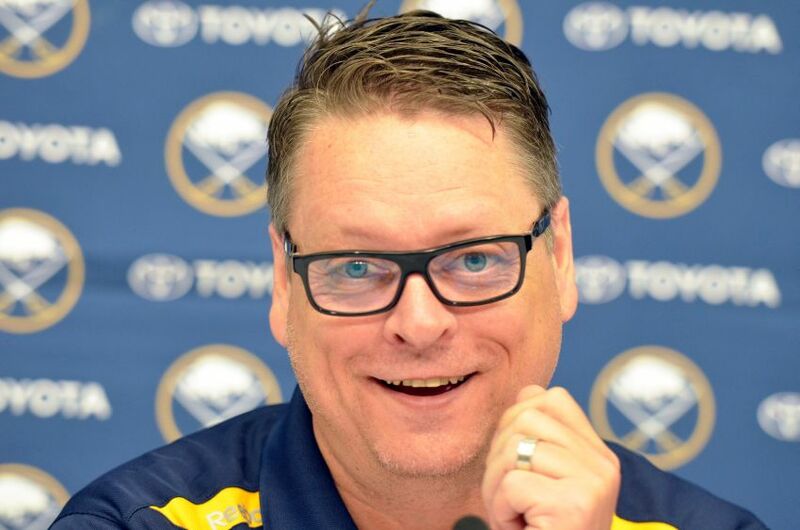 Buffalo’s journey to the cap floor likely won’t be a challenge for Tim Murray as the Sabres’ rebuild progresses. Buffalo will likely hit the draft floor with a hair over $10m in space ($10,714,645 per General Fanager). Should Cody Hodgson be bought out, the figure will move to $13,922,979. Buffalo was right around $12m to the floor last year and since I’m betting on Hodgson being bought out, I’m going to proceed with the higher figure as my goal for the cap floor. The biggest differentiating factor this year is that there isn’t a large RFA deal on the horizon for the Sabres to help carve out their gap to the floor. Tyler Ennis alone took care of $4.6m in space when his new deal was inked last summer. The Sabres are ripe with restricted and unrestricted free agents, but no one who will be re-signed are expected to carry a significant hit. In fact, it’s unlikely that any of Buffalo’s RFAs see anything more than a qualifying offer. Mark Pysyk and Johan Larsson are the two most prominent RFAs who could potentially ask for a bridge deal, but I’d still bet on qualifying offers for each. All this means is that the RFAs Tim Murray chooses to retain won’t eat up a major portion of the cap. In fact, I’d be surprised if more than two current RFAs are with the big club next year. Working under the assumption that Sam Reinhart will start the year in Buffalo along with Tim Schaller, Pysyk and Larsson, I come up with an estimated figure right in the $3.5m neighborhood. That may be a little light but I’d rather aim low than set unrealistic expectations. For example, Mark Pysyk could get a bridge deal that pays him two or three million a year which would account for an even larger chunk of cap. Those moves put the organization just $10.2m short of the floor without accounting for any trades or unrestricted free agent signings. I expect Murray to follow a nearly identical path as he did last year in free agency. Two forwards will likely be brought in to reinforce the top and bottom-six, a veteran defenseman will be acquired and a goalie will be needed this year as well. Since I worked to steer clear of tabbing specific names as players the Sabres could or should chase in order to hit the cap floor last year and I’m going to try to do the same this year. I’ll sprinkle in a name or two here and there to provide some clarity on the direction I expect them to go but this will primarily work in terms of general terms. I expect Murray to acquire a goaltender via trade simply because of the assets the Sabres hold entering this weekend. I’m betting on a younger veteran with a lower cap hit like Eddie Lack ($1.15) or Cam Talbot ($1.45) who will be able to grow with the team in the coming seasons. While a free agent shouldn’t be ruled out, it would appear the trade route is the most likely. Acquiring a goalie via trade means that a smaller amount will be carved from the cap floor. Using Talbot’s salary as the barometer chips away $1.45 in total. Given that Tim Murray has shown a willingness to get aggressive on the trade market, I wouldn’t be shocked if he ironed out an agreement for NHL talent. He’s spoken at length on his desire to acquire another young forward and with names like Kyle Okposo and Ryan O’Reilly floating around, he won’t be short on options. Acquiring a player already under contract will likely bring a larger salary in house overnight. But it will also take a hefty trade offer which won’t be easy to craft. Given that the trade route is a little more difficult to navigate, I’ll assume no massive moves are made between the Sabres and another club. The Sabres will need another body for the top six and a contributor capable of filling bottom-six minutes. Spending between $4.5 and $5m on a top-six forward is the going rate these days and should fetch the Sabres a quality forward. Slotting-in a player like Mike Santorelli at his rate from last season ($1.5m) along with possibly another $1m for a 13th forward (Matt Ellis, for example) rounds out a decent spending spree up front; $8.45m in total thus far. Since Buffalo’s blueline is relatively stuffed, I wouldn’t expect Murray to go out and hit on three veterans like he did last year with Tyson Strachan, Andre Benoit and Andrej Meszaros. In fact, any more than one veteran signing would shock me. The Sabres already have Zach Bogosian, a hobbled Josh Gorges, Mark Pysyk, Rasmus Ristolainen, Mike Weber and Nikita Zadorov penciled in for minutes next season. Adding a quality veteran to the mix would allow Weber to rotate in as the 7th man while also giving a young group a bit more guidance. I’d be looking at spending at least $3.75m on a defenseman and if someone like Christian Ehrhoff (a longshot, I know) could be brought back in the $4m neighborhood, I wouldn’t hesitate. Regardless of who they pursue, he should be able to slot into second or third pairing minutes so that he can cover for Gorges while he recovers from microfracture surgery and even potentially holding those second pair minutes to help ease the load on Gorges upon his return. Should the spending on a defender hit the $4m threshold, my ledger would read $12.45m spent on the free agent and trade market. Add in the ballpark figure of $3.5 from RFAs or new rookie faces and we’ve eclipsed the cap floor with relative ease. Obviously the challenge will be selling free agents on where the Sabres stand in their rebuild along with identifying a willing trade partner for either a goalie, forward or both. Like last year, the path to the floor won’t be nearly as difficult as some may make it seem. In fact, with the addition of Jack Eichel it may be seen as an even easier feat.